I've been mulling over my thoughts for this post for a while now-- so much has been written in the past couple of months in the jewelry world about copying, infringement of ideas, theft of intellectual property, etc. As an artist who works primarily in polymer, I was feeling a bit smug as our little piece of the artistic pie has been relatively free from these sorts of public spats. The polymer world is well-known for its art retreats, dating almost from the introduction of the medium, where polymer people get together to work and freely share ideas and techniques. But lately there's been trouble in Paradise. An officer of the International Polymer Clay Association wrote an article for the October issue of the IPCA newsletter that pretty baldly wondered what the big deal was about copying another artist's work and selling that product once the artist had shared their technique for it in a publication. Nan Roche, a pioneer in polymer and author of one of the first important books on polymer technique, made some very clear distinctions about what constitutes copying in her article published back in 1999. She talks about what is and isn't public domain: techniques are, subject matter is and combinations of colors and/or particular shapes are. But she cautions that “The problem arises when one uses a particular technique+subject matter+color/shape in the same configuration as a particular artist. It stands to reason that if you combine all the same components in the same way, it's going to look very closely like the original artists' work.” I think it's pretty much common sense that it's a no-no to sell this product, publish it or teach it. But here's another reason why it's really a bad idea to do this. Luann Udell, in her excellent and informative blog, responds directly to the IPCA article in the organization's newsletter and references her insightful blog post, titled “What is the Story only you can tell? She wonders about people who copy and why they would want to substitute someone else's story for their own powerful and wonderful one. As she says “...in YOU, is a story that only YOU can tell. I interpret this to mean, when you copy, you basically rip yourself off, even worse than you've ripped off the artist that you've stolen from. Your piece has no "authentic voice", it's just a manipulation of objects or colors, it has nothing of you in it. Personally, I find it impossible to copy anyone's work exactly. I always have to do my own thing. I love to look at other people's work, I find it a very rich source of ideas but I never want to copy it. The first thing I think is “oh, that's a good idea” and my very next thought is of what I can do with it to make it my own. Usually the idea inspires something completely new, not derivative in any sense. It just jogs my own imagination and creativity. Just as the natural world does this for me, inspiring me to try colors and textures in my work. I've seen some blog posts lately in which people claim that they keep their art “pure” by not looking at others' published work in popular magazines. That's just limiting and you're deluding yourself if you think that you're not noticing what's out there around you. So I've been wondering to myself, what is the antidote to all this angst in art? What positive statement can I make to address this worry about what's mine vs what's yours? So I decided to recruit my old friend, Collaboration! In my Flickr surfing lately I've discovered two polymer artists whose work I really admire and adore and so I asked the two of them if they would like to collaborate on some pieces together and they cheerfully agreed. 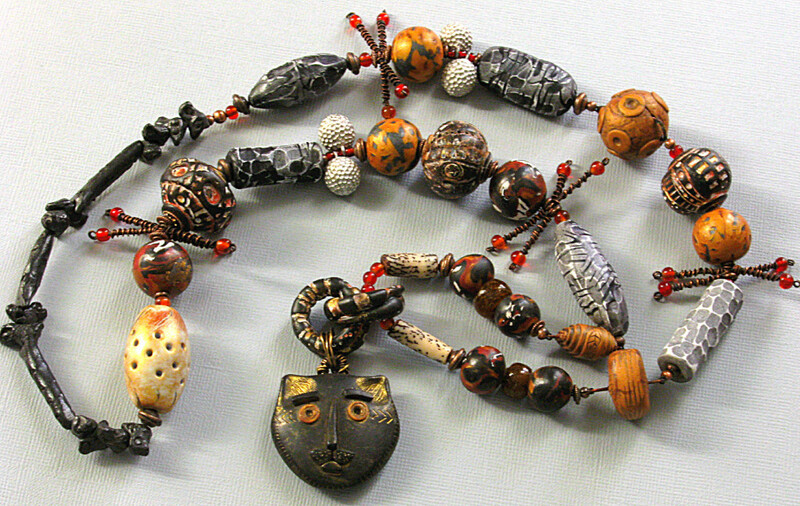 This first piece was designed around the folk-arty and sculptural cat focal of Rebecca Watkins (ArtyBecca) for my annual Hallowe'en necklace, joined by the quirky and stylish beads of Claire Maunsell (StillPointWorks). Both these ladies have techniques that I thought would complement my own aesthetic, while at the same time, would inspire some beads by me that would meld their styles into something entirely new. It's titled after Rebecca's name for her cat/man focal bead. The long textured beads in black, white and gray are by Claire, and I also used some of Rebecca's gold textured beads with integral metal loops and a long ivory one in the design. After adding three chunky, textured and highly antiqued beads I newly made to coordinate with my collaborators' pieces, I ransacked my older beads for some with red accents and made some wire-wrapped and beaded sticks to add color and texture. 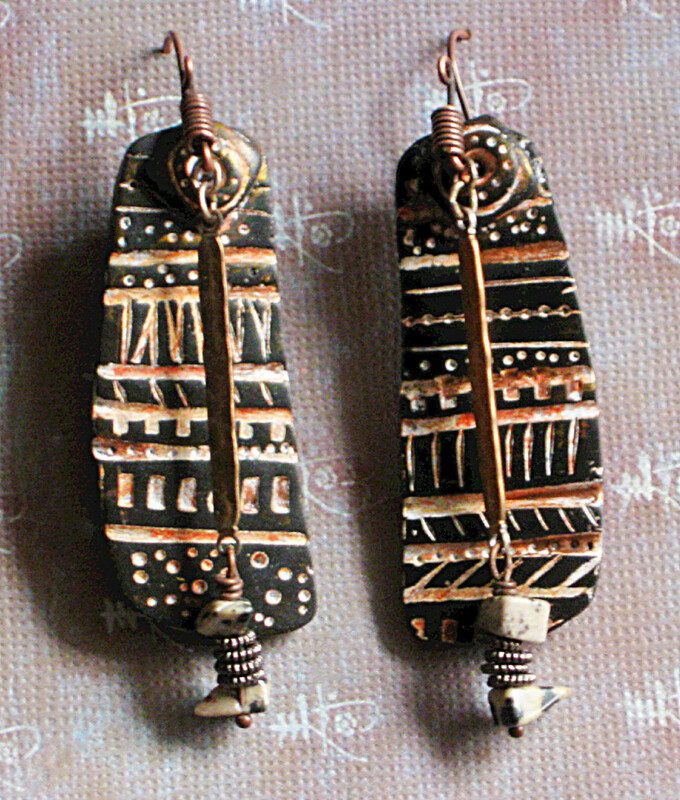 After watching a tutorial by Maggie Maggio on making polymer links for a necklace that I found on Cynthia Tinapple's blog, Polymer Clay Daily, I experimented with making my own interpretation and created textured black antiqued links for the focal's bail. 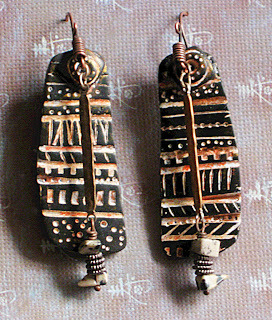 With the clay left over from my beads I made these, adding Dalmation jasper to the copper dangles and finished them with handmade copper earwires and coils. My collaboration buddies have spurred both my interest in and experimentation with texture and antiquing and I've been just knocking the work out so expect to see more in the next few blogs. So I think we can all play together nicely if we just respect each other's stories and celebrate our own. Simple, isn't it?